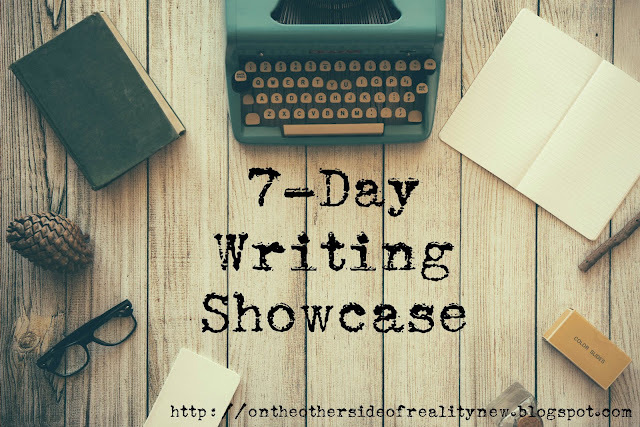 Due to all the positive feedback on my latest post, I have decided to hold a 7-Day Writing Showcase! A showcase on this blog, going on for seven days, to share the awesome talent of writers in the comm! Each day for one week, I will post a writing piece by a different writer in the comm. If you would like to have something of yours featured in the showcase, email me through the contact form on my sidebar. Links to which of your blog(s) you would like me to link to in the post. Submissions are open from today until this Wednesday, January 27th at 11:59pm Central Time. Once you've emailed me, comment on this post so I know you've submitted something. That way, if the email doesn't go through we can organize another way for me to receive your submission. I will accept pretty much any genre/format: short story, excerpt, monologue, poem, fanfiction, diary entry, play, whatever floats your boat! You can still enter if you don't have a blog! Old pieces or pieces you've already published on your blog are allowed! Just a warning: if you submit something you've already published on your blog, people who've seen that post on your blog might skip over it when it's published on here. If you submit something you've not published before, however, everyone would still be interested in seeing it on here! There are six spots left, as I've already had one advance entry. If I receive more than six entries, I will randomize it to see who gets a "spot". Anyone who does not get a spot will still be given a shoutout by me (with a link to their blog) at the end of the week. The Showcase will be held from January 31st - February 6th. Any questions? Comment them below, and I'll do my best to answer them. I hope you can participate! I sent in one (but I also sent in a shorter one in case the first one is too long). Nah, it's not too long. I'll use the first one (CWWC 2). I got it! Just for clarification, which part is supposed to be italicized? Is it the first and last line only, or the whole of the poem except the first line? Also, would you like me to link to Lost, An Open Window, or both in the post? ^^^^^^^ this is to Emily, btw. I got it! Thank you for entering :) Just wondering, which of your blogs would you like me to link to? You can definitely still enter! I think anyone who wants to should be able to enter, so if I get more than seven entries, I'll just randomize to see who gets a spot. Anyone who doesn't will still get a shoutout with a link to their blog! I'll enter! But sadly, since I won't have time to write tomorrow, and it's already late, I'll have to submit an old piece. :( I'll probably do a page of Maybe Someday. I sent you my entry! Yup, you can still enter! Submissions are open until 11:59 CT tonight. Hey! Is it too late to submit an entry? I was at my dad's for the weekend and completely forgot about it! Sorry!